Rovers on Mars have captured images of dust devils before, but this might be the best one we’ve ever seen. 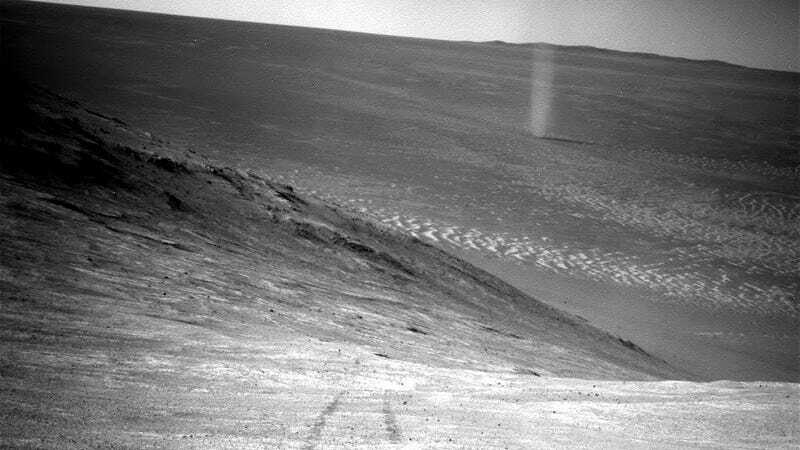 NASA’s Opportunity rover, which has been exploring the surface of Mars since 2004, snapped a stunning new dust devil pic on March 31, 2016. Like our planet, Mars features these columns of rotating hot air that pick up the sand and dust around them once they spin fast enough, making the vortex visible. This almost artistic view of the dust devil looks back at Opportunity’s tracks leading up the “Knudsen Ridge,” which forms part of the “Marathon Valley.” During its trip up the slope, Opportunity managed a tilt of 32 degrees, which is the steepest for any rover. Dust devils have largely eluded Opportunity during its mission. Its twin rover, Spirit, managed to witness a number of dust devils during its tenure on Mars. These mini-twisters are fairly common on the Red Planet and were portrayed with dramatic effect in The Martian. But as we can now see from photos of actual Martian dust devils, the special effects were pretty close to the real thing.